ArcGIS for Server integrates aerial imagery and current data to provide a compelling visual for communicating airport expansion progress. The self-service portal provides an easy-to-use map of basic airport information, such as buildings, roads, and parking lots. Using GIS has significantly increased efficiency when responding to utility locate requests. Those traveling through Edmonton Inter-national Airport (EIA) in Alberta, Canada, recently may have noticed the renovated central terminal and newly opened US terminal facilities, as well as other construction activities throughout the airport. EIA is undergoing a $1.1 billion expansion project that will nearly double its 5.5 million passenger capacity to accommodate the rapid growth in passenger traffic. In addition to a more spacious terminal building, travelers can now enjoy more comfortable passenger lounges and more than 30 new shopping and dining outlets at the expanded terminal. The airport is also constructing a new central tower, a power substation, an upgraded utilities plant, and more than a dozen new aircraft bridges and ramps for aircraft parking. Implementing such a large-scale construction project involves coordinated planning and execution among many groups, including hundreds of staff, contractors, and consultants. To efficiently manage the project, EIA leveraged web mapping technology to create a complete picture of who is where at the site and what construction project or activity may be occurring within its vicinity. 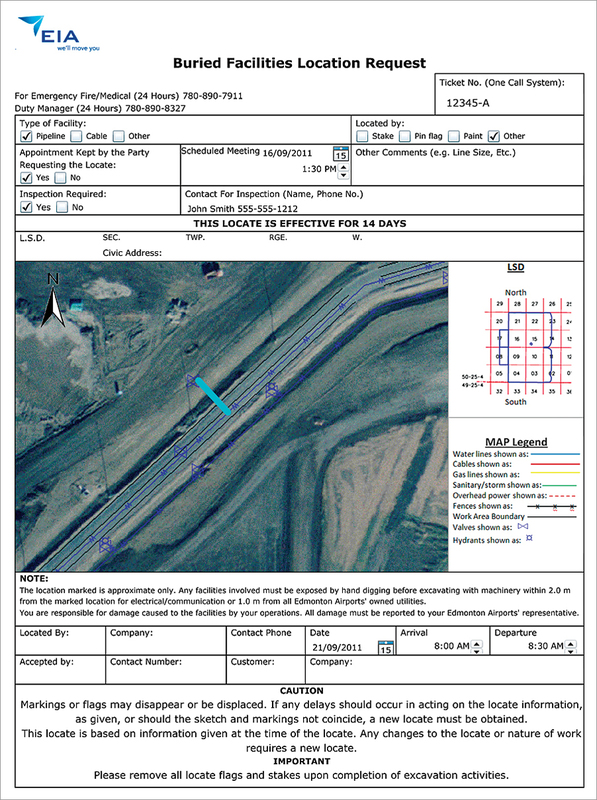 Previously, the airport’s technical services team supplied field-workers with paper drawings of construction sites and utility networks generated through a computer-aided design (CAD) system. While the drawings delivered rich graphic representations of airport assets, they did not provide a spatial context for analyzing relationships between the assets. As work plans changed daily, it became a costly, time-consuming task to update, reprint, and redistribute the drawings to field-workers. Users can view all aboveground and buried airport assets and their locations through the web application. 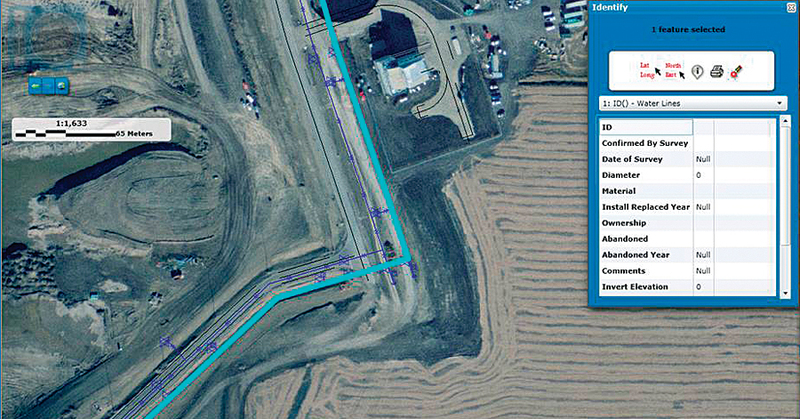 Following a review of potential solutions, EIA engaged Esri Canada Limited to develop an innovative web-based Utility Locator application that allows staff and contractors to quickly access accurate and up-to-date information about the airport’s utility assets. The application was deployed in June 2011, just in time for the busy summer construction period. ArcGIS allows EIA to deliver information over the web without requiring additional user training. This is critical because many of its target users do not come from a technical background. EIA uses ArcGIS for Server to integrate numerous databases containing information on the airport’s utility assets, including air-side and ground-side electrical systems; natural gas, water, storm water, and sewer networks; as well as construction projects, road networks, buildings, and other geographic data, into a geodatabase. The application was built using ArcGIS API for Silverlight. The system enabled EIA to provide role-based user access to specific information and tools within the application and maintain data integrity and accuracy. Members of the technical services team could fill out forms through the application, while project delivery staff was given secure, read-only access. The Utility Locator makes it easier for contractors to analyze the site and understand the risk before they put the backhoe into the ground. The quality of locate reports has improved immensely. Staff can now produce more insightful reports that include complete details about a specific site, enabling better decisions. The application allows them to create drawings that look exactly like the site, both in context and scale. As well, having a consistent view of utility and project data fosters better communication and teamwork among staff and contractors. The self-service portal provides an easy-to-use map of basic airport information, such as buildings, roads, and parking lots. This has already reduced the number of inquiries for site information received by the technical services team from internal staff, allowing them to focus on other tasks. The GIS integrates aerial imagery and current data, providing a compelling visual for effectively communicating EIA’s development plan and progress to the public. The application also displays boundaries of construction projects, allowing staff to check for conflicts between consecutive projects. EIA was recently named the Most Efficient Airport in Canada by the Air Transport Research Society. Maintaining this exceptional level of efficiency requires embracing technology that helps the airport continually improve its services. With the numerous important benefits GIS provides, the technology has become a critical information management system that is propelling EIA’s service level to even greater heights. For more information, contact Amanda Graff, Esri Canada Limited.